If you’ve never tried cracked glass before then you really need to try this fun technique. It’s really simple. Stamp your image however you want it to look. I actually stamped mine and then colored it in. Make sure your paper is cut to the size the you want your final piece to be. Third cover the entire piece of paper with versa mark ink. I just press my paper right down into the pad. Let cool a minute and then repeat steps 3-5. Let cool and repeat steps 3-5. This should be your third time. It should be really thick and look watery on the page. Put the paper in the Freezer. Let is sit for 10 to 15 minutes. You wanted it to be cold and really solid. It will usually curl up. Remove from freezer and bend back gently cracking the the the embossing powder. Be sure to only bend slightly so that you don’t actually crease your card-stock. Continue bending until you have your desired look. You can also put it back in the freezer for a minute if it is starting to get soft. Make sure you crack it immediately. It won’t crack at room temperature. Finish your project as desired. 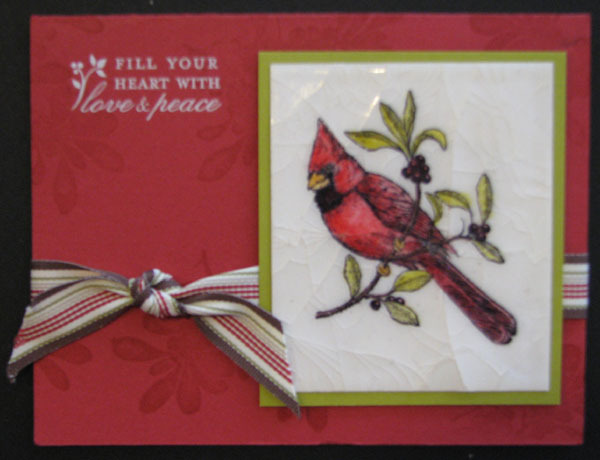 Here is a sample of the card I made using this fun technique. I will try to get pictures posted of the actual steps a little later.